Viognier (pronounced Vee-Ohn-Yay) is a very special grape and one that must be handled with great care. The Viognier grape/wine is a special treat. It is a wine that has distinct characteristics: perfume, floral notes and acidity, but it is also a very picky grape. It is very easy to lose to mold and because of this wineries will plant roses next to the grape vines to act as a canary for detecting mildew early on. The grape needs to be picked late otherwise; it does not generate the classic perfume that we are used to seeing in Muscat and Riesling wines. The wine maker has many choices with how he/she wants to manage the grapes. The wine maker can allow the wine to go through malolactic fermentation (to give it a bit more weight) or let the wine lie in the must (to give it more perfume) or to let it have a bit of wood to give it roundness. With all the choices and difficulties that Viognier wines have, they rarely meet expectations and are therefore, not one of the current popular white wines. Finally, Viognier is not meant for long storage – hence the VERY early release dates on these wines, also the wine should have the acidity, fruit, and perfume to make it a real winner. 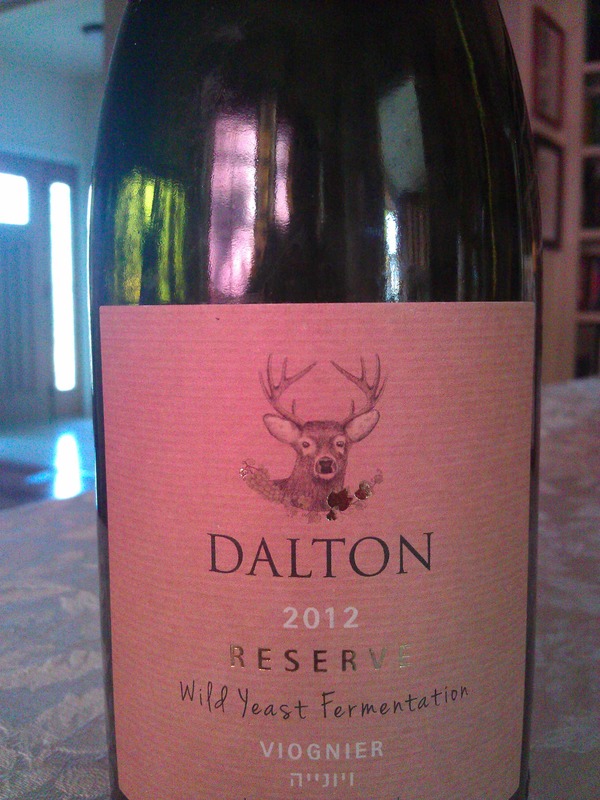 The 2012 Dalton Viognier Reserve Wild Yeast is a very special wine, and one that really shows the wine making skills of the Dalton Winery. To start, Viognier is one of those grapes that are super finicky to grow and produce. A Viognier is classified by its creamy and rich consistency, famous Viognier perfume, and rich fruit, all packaged in a dry white wine. It differs from Chardonnay, because where Chardonnay normally has residual sugar (non fermented sugar that adds a lift and some sweetness), Viognier is normally bone dry. It is ironic that when you taste this magnificent wine, you may initially think this is a sweet wine, but instead what you are sensing is the ripe fruit and the rich perfume that make this wine a truly successful Viognier! I have been waiting with baited breath for this wine to be released, and I must stress that this wine is different to some extent from previous vintages, but equally lovely. To start this wine is pure oak, and a wine that you would think was a total disaster – but you would be VERY wrong! This is a classic example of a wine that needs time to let the oak settle and let the fruit appear! What fruit WOW! Once that oak becomes a background, rather than a primary sense, you get the full throttle Viognier effect! The lovely flower perfume, followed by the wine’s classic oily texture makes the waiting all worth it!!! This wine is a powerhouse that will easily go head to head with any fowl you throw at it this coming holiday season. Bravo to the Dalton Winery, their wine maker; Na’ama Mualem, and the Haruni family for having the foresight to believe in the ability of Viognier to gladden a man’s heart! This is a wine that continues it fantastic tradition, and for sometime, as I was tasting this wine, it had seemed to have hit a bump in the road this year. Out of the bottle the wine tastes more oak driven than previous vintages, and in some ways, initially, lacks the complexity and richness that previous vintages showed. Still, this is a wine with a storied tradition that demanded patience and with more air – it paid off in spades! The wine, over time, opened to its old oily-self, rich with mineral, spice, now nice char, and solid fruit! The wine starts off like it was just taken out of a smoke house, with almost kiln like notes of toast, char, smokey aromas, and honey. With time the wine opens to a lovely and sensual white flower perfume, honeysuckle, peach, apricot, along with oily notes, and cut grass, and mineral. The mouth is medium in weight and shows more oak, along with lovely bracing acidity, along with a lovely oily texture, along with toasted hay, kiwi, quince, and white pepper. The finish is long and spicy with more black pepper, cloves, slate, and lovely orange pith – BRAVO!! 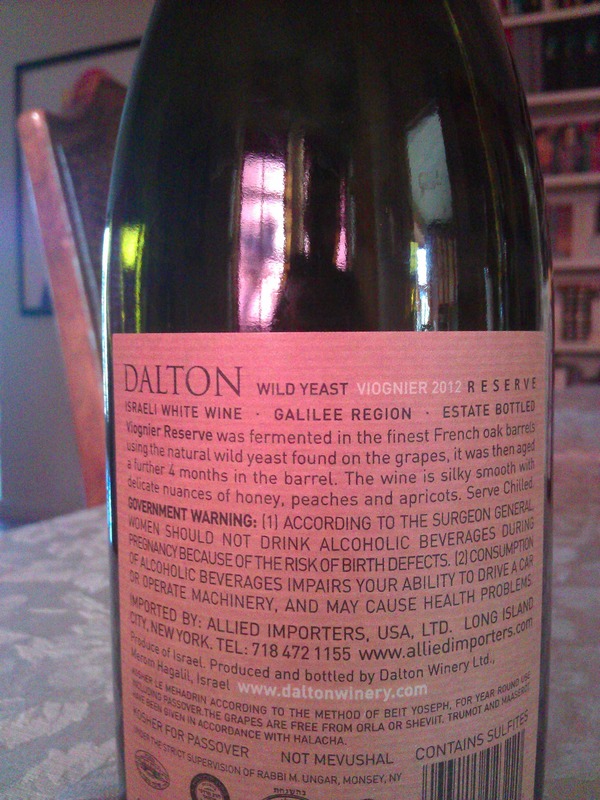 Posted on September 18, 2013, in Israel, Israeli Wine, Kosher White Wine, Kosher Wine, Wine and tagged Dalton Winery, Reserve, Viognier, Wild yeast. Bookmark the permalink. 4 Comments. i bought a case expecting the same amazing experience as the ’09, which i previously bought a case of as well – and i fell in love with. i was very disappointed – at first thinking that i got a very bad bottle. the wine tasted almost “soapy” with a bitterness mixed in with a subtle sweet, and an awful finish. i let it air out a bit, like a few hours, and it definitely improved, but only slightly. my second bottle was a little better, being that i let it air out first, but still it was not enjoyable. im under the impression that this grape needs to be young, but this is still very early in the release. i will wait a month or two to see if it has changed. Tasted in Israel. Do you know where it can be purchased in the US?